Made with LB Collection Baby Alpaca, the Oh My Cowl features an easy 4 row repeat and a sweet little edging for an incredibly soft, feminine look. If Alpaca doesn’t work well for you, it would look amazing in the bold pops of color found in LB Collection Superwash Merino, or Cotton Bamboo if allergies are an issue! Best of all, the yarns are carried up along the inside of the cowl, so there are only a few ends to weave in when you’re done! Round 5: Continuing with Color A, ch 1, sc in next ch-1 sp, ch 2, *V st in next sc st,** ch 5, skip big shell; repeat from * around, ending last repeat at **, ch 2, join to 1st sc with sl st. Round 7 – 18: Repeat Rounds 3 – 6 three times. Round 19 and 20: Repeat Round 3 and 4. Bottom Edging: With Color B, join to any foundation chain st at the bottom of Round 1, repeat Round 23/Top Edging. And that’s the Oh My Cowl! I’m thinking of a matching hat… what do you think? Would you like to have a set? Let me know in the comments! 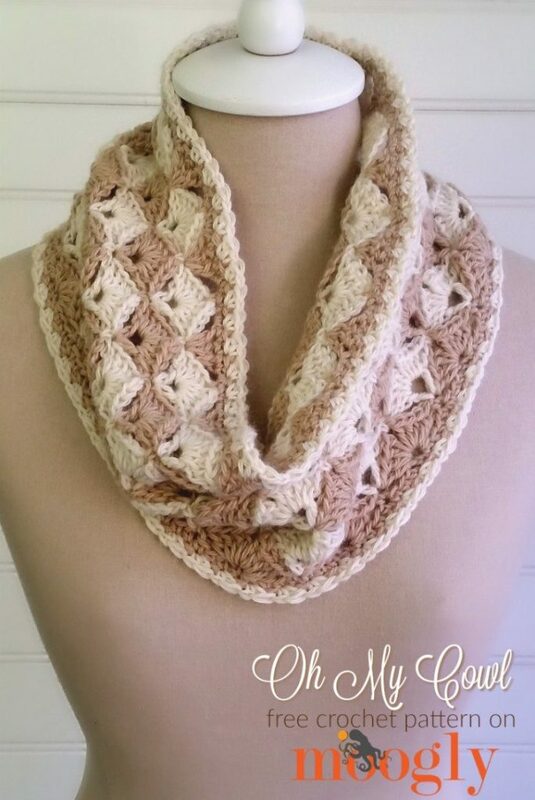 I love the soft look of this cowl. The big shell stitches look amazing. I just happen to have a skein of Caron Simply Soft in bone. I may have to make this today as we wait out the rest of the storm. thank you helen! stay safe – it’s so scary even from afar! Tamara, you’ve outdone yourself with this pattern!! Thank you for being so generous with your talents. YES!!!!! hat and fingerless gloves will be good, you are soooo talented. I love your tutorials and classes. Yes! I would love to have a hat pattern. This cowl is so beautiful, I may have to put aside my other WIPs and start this! Thanks for your tutorials and patterns – you are so creative! YES! A matching hat would be so cool! Could you post it @ the end of pattern for cowl or mitts??? Thanks! Very pretty. Hurricane Matthew blew by without any damage (here). Now I can crochet again. Thank you so much Lisa! I’m so glad you are safe!! Mwahahahah! 😉 Thank you Calenna! Yes to the hat! Maybe boot cuffs? Your designs are beautiful Thank you for sharing them with us! Ooo, boot cuffs! Good one! Thank you Maria! Thank you so much Kerri!! 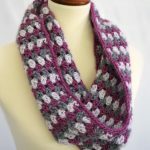 Thank again for a wonderfully beautiful cowl pattern. And yes a matching hat for a set would be awesome! So pretty! Is the pattern available to do as an throw or afghan? Trying to figure out edges and turns! Not currently – but perhaps down the road! 🙂 Thank you! Please, please, pretty please! 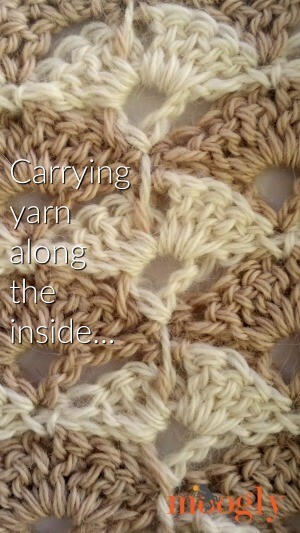 Would love to do an Afghan in this pattern. ? I love Bavarian stitch. Other items using it would be lovely! Thank you! 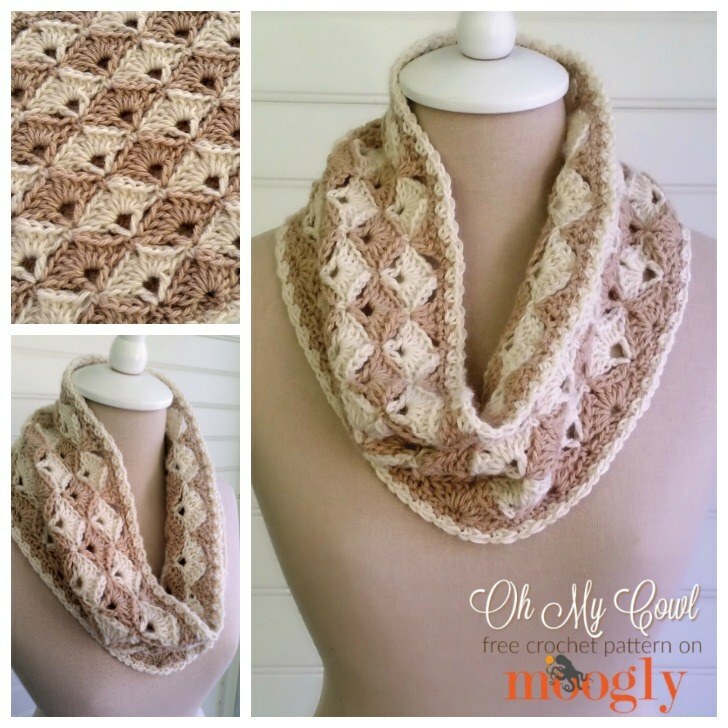 Love this cowl…please add a hat! It’s on the agenda for sure, later this month if all goes well! 🙂 Thank you Jayne! Ooo, a headband! Good idea, thanks Sheila! Beautiful cowl. I love that stitch. Yes, please, a hat pattern would be nice. Thank you for all that you do for us. Love your patterns. Thank you so much Jean! 😀 A hat is on the agenda for sure! I love this Cowl! I think that A hat would be nice to go with it! And perhaps some finger-less gloves as well? 🙂 I am actually simply grateful for the time you took to create this pattern for us! You are a Beautiful person! Thank you So very Much!! I just finished this cowl. Lovely pattern. Works up quick. Would love to share my photo but unsure how. Thank you Sharon! Unfortunately, I don’t have the ability to host photos here in the comments, but you are welcome to share it on Ravelry and send me a message, post it on the Moogly Facebook page, or email me at the Contact Me button at the top! 🙂 I’d love to see it! Hi I’m a little lost as to how to work round three. I don’t understand where to go after I chain 8. What SC am I going in? I skip that whole shell? How will the chain 8 not go out of place. Thanks for any clarification you can give me. I’m really looking forward to making this BEAUTIFUL cowl!!!? Hi! Love this pattern! Though I am stuck on round 4, I am confused where to go after I ch 4 and 4 dc into next ch-1 sp, I am having trouble figuring out where the next ch-1 sp is that I am to put 4 dc into. Hope this makes sense. Hi Courtney! 🙂 Thank you! Be sure those first 4 dc are in the ch-1 sp *before* the join – you’re actually going backwards a little bit here. Then.. The next ch-1 sp is in the middle of the big shell (but that gets a sc st), so the next big shell (4 dc, ch 1, 4 dc) is in the ch-1 sp of the next V st of the previous round. Remember that in Round 3, you worked a V st between each big shell – that’s where the big shells go in Round 4. 🙂 Does that help? 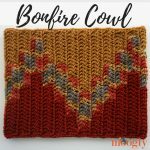 I was wondering about the oh my cowl pattern . Im not too sure about round 3. Hi Crystal! What aren’t you sure about? It was answered in the previous comment sorry. Glad you found it then! 😀 No worries! I noticed you have a youtube channel. Could you possibly do a vidwo on this. Just not getting it right. 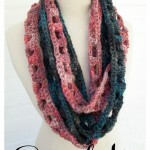 I’d like to make this only in a scarf like form, not a cowl. Do you know the ending finish for rows? Love look this but just a quick query – am i joining the foundation row with a slip stitch then moving onto sc’s in the round; or am i working back along the foundation row then joining into a round at the end of the sc row? Thank you! 🙂 I’m making this using a 6mm hook and 4 Seasons Marvel Soft 8ply acrylic (like Panda Magnum Soft for those in the US) in light grey and a soft greyish blue and it’s turning out wonderfully drapey 🙂 I’ve also increased the length to a starting foundation chain of 161 so that the recipient will be able to wrap it twice around her neck or leave it loose and it won’t be too long! Assuming it turns out well, I’ll put a pic on your Ravelry page? Have you made a YouTube video? I’m a beginner who would really like to make this but need some help. I feel like if I could watch you do the first couple couple rows, I could get it! Hi, I just love this pattern. Made one for my MIL in navy blue and gray. She absolutely loved it and was so giddy when she received it. She requested a BOOT CUFF instead for Christmas, so I thought I’d share how I did it off of your pattern. With J in all navy, I chained 32+1 loosely. Worked rounds 1-6, repeated round 3+4 then finished round 21-23. Any chains I chained loosely to keep it from being to tight in these areas. It turned out nicely and there is a lot of give in these. When all was done the cuffs were about 5.5″x5.5″ when pressed flat. They look amazing. Thank you for all you share. I love your brain and how it works lol! I started out as a newb with your soap saver and continued working your tutorials/patterns. Now I have progressed and grown so far that I surprise myself sometimes. You’re my fav blogger and can’t wait to see what you come out with next! ♥ Thank you so much Cassie! Fabulous pattern and I love how flexible it is. I’m a newbie but I had to do this when I saw it – then I realised I only had very fine wool (about a 4 ply) so I got the right length foundation after a couple of tries and decided to use double foundation chain to make the set up easier and it worked like a dream – the result is a lovely lightweight cowl. 😀 Thank you so much Pearl, I’m so glad you enjoyed it! 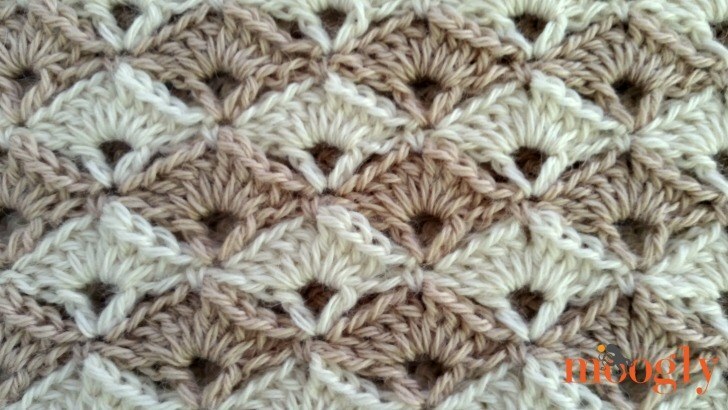 This is a beautiful pattern, and thank you for the video! Even with its help, I am having a hard time with this! It is coming out gappy and wobbly. I tried going down a hook size and it helped some. I will keep trying. I mainly just wanted to say ‘thank you’ for sharing so many patterns and videos. You have helped me a great deal! Thank you Lyric! I’m sorry you’re having trouble – going down a hook size or two is a great solution, because we all have different gauges and tensions! Thank you I went and doulded the pattern an my granddaughter loves it. 😀 Fantastic! I’m so glad to hear it, thank you Jaclyn! taking out the time to read my comment. I have watched the video for the pattern and, as always, I have trouble following it! I absolutely love the stitch diagrams you have created for other patterns and was wondering if you could do one for this pattern. I would be forever greatful! I’m so glad you figured it out Nancy! 🙂 I hope you enjoy making it! 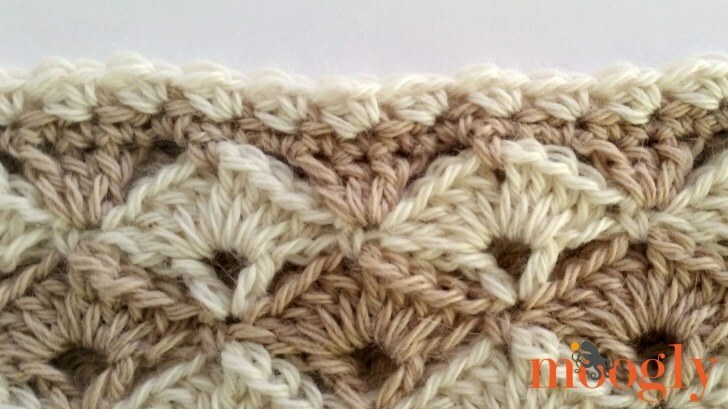 I simply adore this cowl pattern..Did you ever get around to a pattern in this stitch for a blanket? ?..Last year you mentioned that you may do so..was wondering , .if you ever did..Thanks again for this free pattern..I love it. This is another stunning pattern. I don’t know how you do it, but Im so thankful for your talent and willingness to share. Bless you! how many chains do i need to add ? Hi Tamara! I want to make this a regular scarf rather than a cowl. Can you please help me convert it? Thanks!! Thank you so very much for getting back to me. I appreciate it very much. I can’t wait to get started on my sisters gift. Happy New Year!!!! Hello Tamara. I am an absolute newbie to crochet so have just found your site and wanted to say thank you for your generosity in sharing your time, skills and knowledge not only in crochet but in writing, filming and posting the tutorials. I am very grateful for the tutorials, photo and video, and the free patterns to try out the stitches. Thank you. ♥ Thank you so much Deb-Ellen!